Blood clots do not discriminate by age, gender, ethnicity or race. Blood clots affect everyone. Up to 900,000 people are affected by blood clots every year. About 100,000 people die every year due to blood clots. On average, 1 person dies every 6 minutes due to a blood clot.1 Don’t let that person be you or someone you know. 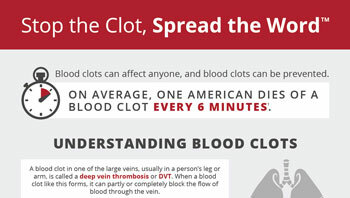 Blood clots can be prevented. A Blood Clot Can Happen to Anyone. Don’t Let a Blood Clot Happen to You. If you think you might be too young or too physically fit to experience a blood clot, think again. Blood clots do not discriminate. They affect people of all ages, race & gender. There are several important signs and symptoms of blood clots. If you can recognize these signs and symptoms, you can save your life or the life of a friend or family member. Blood clots are preventable and can be safely treated. You can reduce your risk by learning some of the best ways to protect yourself from life-threatening blood clots. 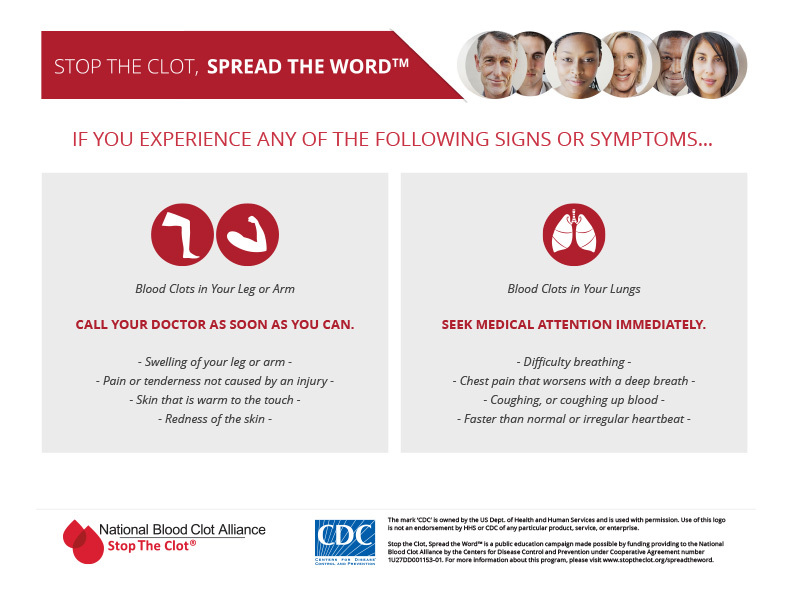 Click on the image to the right to view and share an infographic about blood clot risks, symptoms, and prevention. A blood clot in one of the large veins, usually in a person’s leg or arm, is called a deep vein thrombosis or DVT. When a blood clot like this forms, it can partly or completely block the flow of blood or blood circulation in the body. If this clot is not treated, it can move or break off and travel to the lungs. A blood clot in the lung is called a pulmonary embolism or PE, and can cause death and requires immediate medical attention. and your potential risk factors. Hospitalization, particularly involving trauma, surgery, or immobility due to serious illness or injury, is a major risk factor for blood clots. Click on the image below to learn how hospitalization puts you at greater risk for a blood clot. The first and most important thing you can do to protect yourself from a life-threatening blood clot is to learn if you are at risk. Click on the icon below to download and print the risk factors checklist at left, and then discuss your potential risk factors with your doctor or healthcare provider. Know your risks and recognize the signs and symptoms. 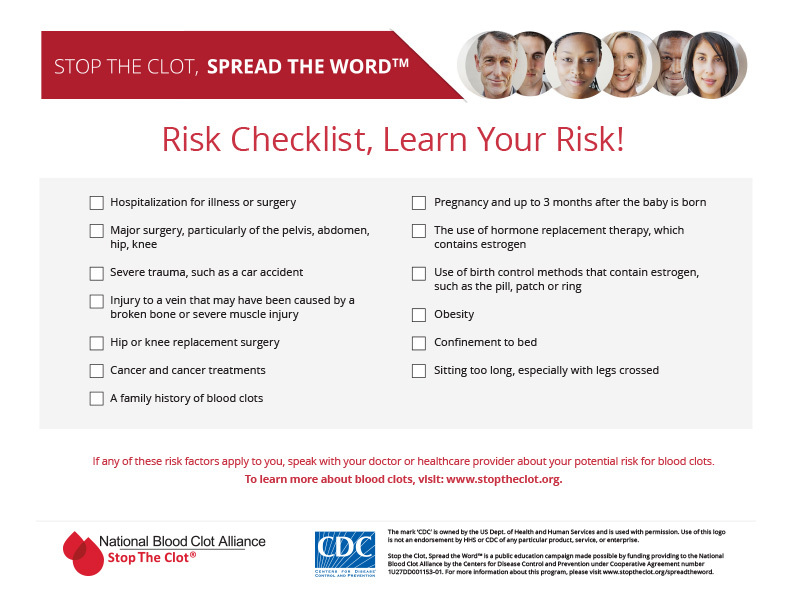 Tell your doctor if you have risk factors for blood clots. Before any surgery, talk with your doctor about blood clots. See your doctor as soon as you can if you do have any symptoms.